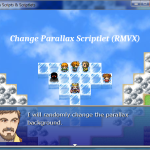 The following section contains the scriptlets available for RMVX. In time, many of these may be improved upon or expanded with additional functions. This small, simple scriptlet allows you to change the parallax image with a single script call in the Event Commands. Parallaxes are pre-defined and can be manually called or randomized. 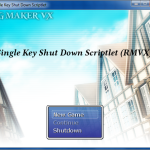 The Single Key Shut Down Scriptlet provides a way to shut down the game very quickly, without having to either click on the X to close the window or go through any of the menus to end the game. The scriptlet actually developed out of boredom, but I guess it could have its practical uses, such as when playing at work and the boss approaches, you’ll likely need a fast, effective method of shutting RPG Maker down. 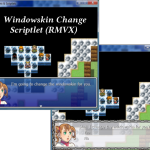 This simple scriptlet allows you to change the windowskin in the middle of the game using a script call Event Command. In addition to being able to change the windowskin, there is also an option to reset the windowskin to its default, also by using a script call Event Command.